Robert Coram, a military historian, is the author of Brute: The Life of Victor Krulak, U.S. Marine. For the Wall Street Journal, he named a five best list of books about America's unsung war heroes. Andrew Jackson Higgins was a New Orleans boat builder whose temper was as fiery as his patriotism. His drop-bow landing craft led the way in every major campaign of World War II—the boats were the ones that soldiers poured from on D-Day. 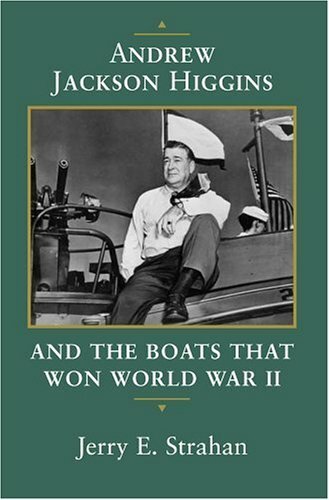 As Jerry E. Strahan notes in his fascinating story of the man and his design, Higgins Boats were fundamental to our war strategy because they made it possible to put men and equipment on beaches. Casualties would have been catastrophic using the underpowered boats with deep-vee bottoms and high gunwales that the U.S. Navy had preferred on the eve of the war. The battles over boat design between the impatient Higgins and the tradition-steeped Navy were epic. "If the Navy wants something sensible," he said, "why the hell don't they listen to people like us who have had years of experience?" After Pearl Harbor, the Navy started listening. Higgins promptly renegotiated his government contracts, declaring that he didn't want to make so much money when American boys were in a shooting war. Also see: Sandi Toksvig's top ten unsung heroines.